'Seemaraja' is a much anticipated movie which has Sivakarthikeyan essaying the lead role. The film which is being bankrolled by RD Raja under the banner of 24 AM Studios also has Samantha essaying the female lead. Directed by Ponram, D Imman has composed the music score for the film. 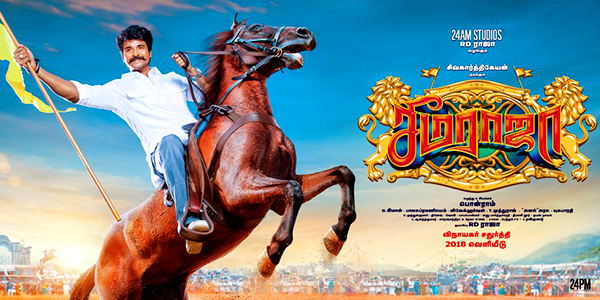 Vaaren Vaaren Seemaraja is a proper rural folk that showers praise on the title character. Percussions as vital in any rural number, takes this songâs energy level up a notch too. Imman and Diwakar as male leads have done their job very neat with no slug in power throughout the track. Yugabharathi's lyrics come very lively with meaning and life philosophy. Farmers, elders, ethics are some of the areas where his thoughts strike. Itâs something very commonly written about for a rising hero, but here at least it doesnât seem too trying. One could imagine fans shaking their legs to this track which would also be a good dance number. Yugabharathiâs lines are simple, doesnât try too much but shows strength. This aspect is also visible in the songâs composition as well. While the percussion soaked background gives a pleasant feel, singers Sean Rolden, Shreya Ghoshal and Imman have not failed to sustain the life of the track. A definite spot in your romantic playlist. The track starts slow with a aseemingly retro background, but then Imman brings in his trademark folkish flavour which greatly amps up the song. Immanâs vocals are felt strongly throughout the song and the peculiar accompaniment only makes it harder to ignore the song. Again, lyrics here are very lucid and in touch with the rural genre. And wait till Vandana Srinivasanâs portions that gives it a tinge of versatility as well. Imman takes centre stage in this song, which is worth repeat hearings. Paraak Paraak starts with a regal introduction for Seemaraja. So, directly to point this is a praise for the the titular character. True to the nature of these compositions, the number is energetic with drum beats, pace and tone (especially Senthil Ganeshâs). Paraak Paraak chorus though seems a bit deliberate. Other than that, a thumbs up for this song. Machakanni has a very catchy tune not to mention the cute lyrics that accompany it. Imman has again sung this song which is an out an out experience of the heroâs feelings for his love. One could say that the pacing for the song is well set. Immanâs strong bold voice helps the song retain variance and still elicit immersion from listeners. A potential hit song. The song carries the same emotion and feel as the earlier track with Shreya Ghoshal getting the major presence. Her voice is as mellifluous as it is pleasantly flowing, especially her intermittent portions of vocal strains is a joy to hear to. Well you have to decide which version you like better! What other better way to start a swag track than with a whistle! And then thumping drum beats, and an accompanying bgm that leads to a riveting rap portion. This track would definitely set the screens on fire depending on how it is placed in the movie for the hero. The title seems very western albeit with a classical touch, weâre talking about the Veena here. Onnavitta Yaarum Unakkilla gets a third sole track in terms of an instrumental. Even after repeat hearings of the song with vocals, it comes off as really pleasant to hear it rendered by sucha a soulful instrument like Veena. But one might have second thoughts on beats and electronic influence in the song as well. Worth a listen during a late night walk.